1. B-29-50-MO 44-86349 John's other Wife 33rd BS/22nd BG Kadena, Okinawa 1950. 2. 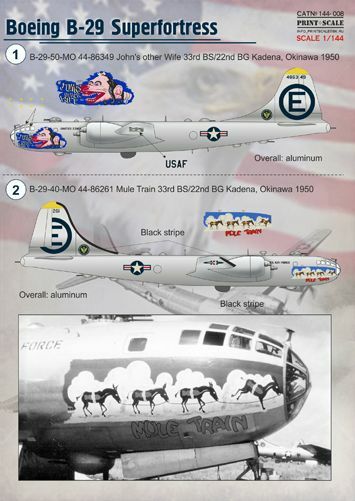 B-29-40-MO 44-86261 Mule Train 33rd BS/22nd BG Kadena, Okinawa 1950. 3. B-29-35-MO 44-61669 Mission Inn 2nd BS/22nd BG Kadena, Okinawa 1950. 4. RB-29A-55-BN 44-61929 Honeybucket Honshos 91st SRS/55th SRW Yokota, Japan 1952. 5. B-29A-70-BN 44-62224 The Wanderer 326th BS/92nd BG Yokota, Japan 1951. 6. B-29-45-MO 44-86284 Downs Clowns 343rd BS/98th BG Yokota, Japan 1951. 7. B-29A-40-BN 44-61676 Sad Sac 343rd BS/98th BG Yokota, Japan 1951. 8. B-29A-70-BN 44-62253 Reluctant Drag'on 345th BS/98th BG Yokota, Japan 1952.